Remember when I said I flew to Chicago for $1? This last trip, I managed to snag an even better deal. Last weekend, Mr. A and I flew to Chicago...and actually MADE money. This is in no way a sponsored post. Frontier Flights didn't pay me to give them a good review. A hotel didn't give us a complementary stay. The city of Chicago didn't track me down and promise me an all expenses paid vacation to drop a few good words about Chicago. How did we manage this? Since I had such a fabulous time during my first trip to Chicago, I decided that Mr. A and I were in desperate need of a date night in a new city. Frontier Flights had just sent an email about another amazing flight sale, and I had already signed up to be a Den Member so I could have access to even better deals. I figured "why not, you only live once." I booked our $19 flights, and scoured the internet for hotel deals. Sadly, our Chicago date night just happened to coincide with one of the largest annual convention. Downtown hotel rates were through the roof. We ended up staying at a seedy hotel (not going to name names) near the airport, on the not so good part of town (internet photos can be so misleading). After arriving at the Hotel from Hell, we decided to spend as little time as possible in that room. My wonderful Mother-In-Law grew up in Chicago, and had recommended Giordanio's for pizza, so we figured we'd stuff our faces with pizza and have a few drinks to ease the pain of having to sleep in a "Bate-esque" Hotel. The restaurant was actually located about 4 miles away from the hotel, so we figured we could walk to it. 10 minutes later, we were caught in a rain storm, and the sidewalk had run out. We were left with two choices: walk on the side of the highway, or go down a seedy alley that looked like something straight out of every horror movie ever made. We called a cab, which actually turned out to be a Town Car and Limousine Company. We figured we were losing daylight and since we were only a few miles away, how costly could it be? $38 dollars later, we arrived at Giordanio's. Giordanio's turned out to be an excellent choice. The pizza was just as amazing as my Mother-In-Law mentioned. The atmosphere, was relaxing and they have awesome beer. Still, factoring in cab fare, it was decidedly the most "expensive" pizza we've ever had. The cab ride back to the hotel didn't go any better. The cabby who arrived claimed he didn't know where the hotel was located, and his GPS, just happened to stop working. Luckily we had our phones with us, and managed to give him directions back to the hotel, but not before he managed to take us on a few unnecessary loops around the parkway. By the time we arrived back at our hotel, we were so exhausted, that we practically collapsed into bed. 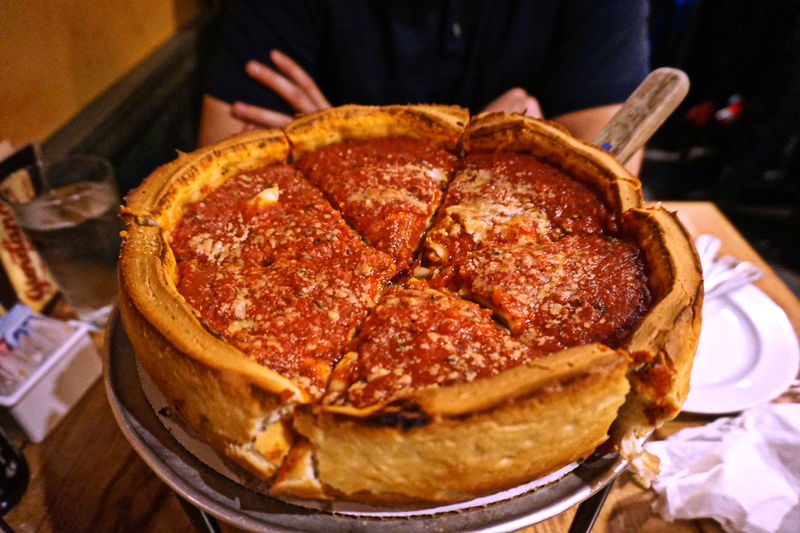 I actually ended up apologizing to Mr. A because I felt like I had destroyed his first "Chicagoan" experience. The next day we were up, dressed and ready to hit the road by 6:00 a.m. We had a quick breakfast and checked out. Then we did something we should have done the night before, we used Uber. Our driver was there is less than 2 minutes, and the ride downtown was absolutely free! See the night before, we met an awesome women in the hotel lobby who was a flight attendant and part time Uber driver. She was kind enough to give us a promo code for $25 off our first Uber ride. Still, even if we didn't have the promo code, I realized that the Uber ride was MUCH cheaper than the regular cab rate. Our "4 mile" cab ride the night before ended up costing us $18. Our 15 mile, 30 minute Uber ride into Downtown Chicago would have only cost $23 without the promo. Our Uber driver was friendly, knowledgeable about Chicago, and had a working GPS. Score! Needless to say, he got a BIG tip! 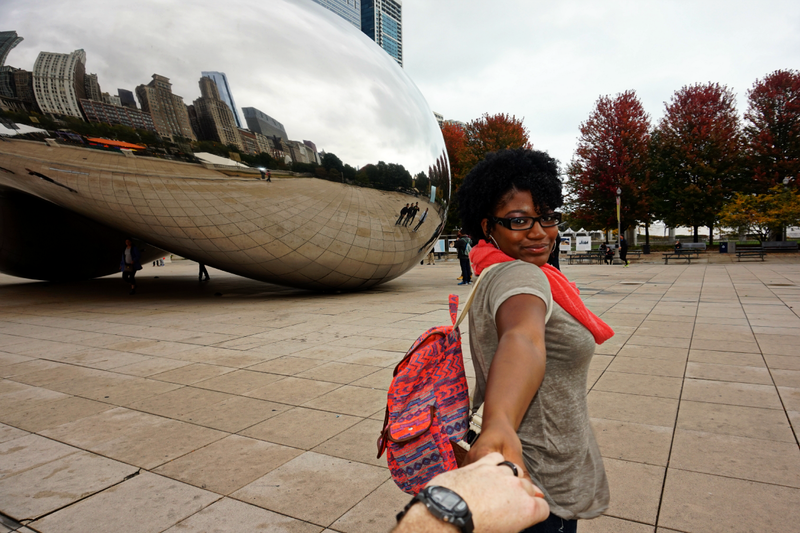 The Cloud Gate aka "The Bean"
We spent the afternoon exploring and tasting our way through the bustling streets of Chicago. Mr. A was beyond impressed at how gorgeous Chicago is. Day two quickly washed away the horrors from the night before. Soon, it was time for us to head to the airport. This time we called Lyft (we had another promo for $10 off your first ride). As we headed to the airport, I started to check us into our fight. But then I realized our flight had been delayed for two hours. We were ecstatic. This meant we had a few more hours to kill. Luckily our Lyft driver knew Chicago like the back of his hand and recommended this awesome restaurant called Portillo's. We spent the next hour or so stuffing our faces with the most amazing hot dogs I've ever had the pleasure of eating (little did we know a few days later The Who would release a report saying that hot dogs are just as carcinogenic as cigarettes). We arrived at the airport early and made it to our gate with time to spare. 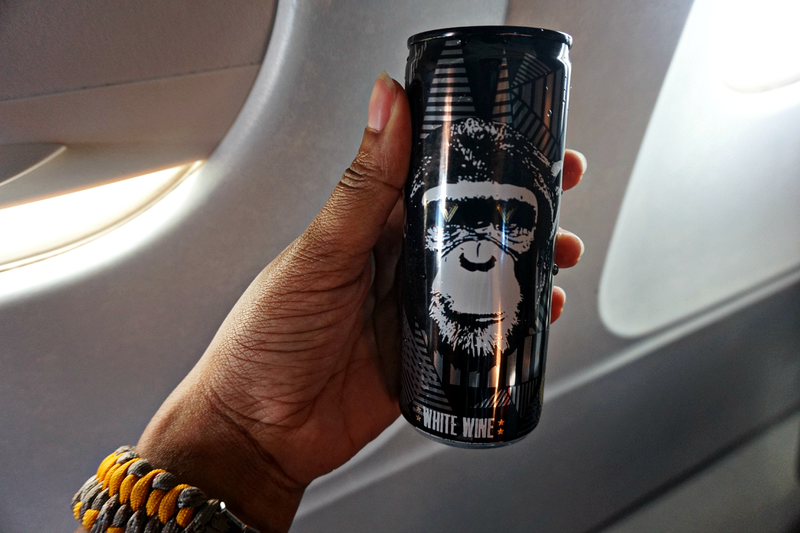 Since we still had time, and I'm a bit of a nervous flier, we decided to get our pre-flight drink on. After I paid a visit to Margarita, we spent time aimlessly wandering around the airport. We boarded shortly after and 1.5 hours later, we were back in Raleigh. That's when I got the first email. Because our flight had been delayed for 2 hours, Frontier Fights sent us $100 a piece in travel credit. The next day I woke up to another email, we had been given an additional $50 a piece in travel credit as another apology for our delay. That means we spent $80 on a roundtrip flight for two to Chicago, and were given $300 in travel credit, meaning that we were basically paid to go to Chicago and have an insanely awesome date night. 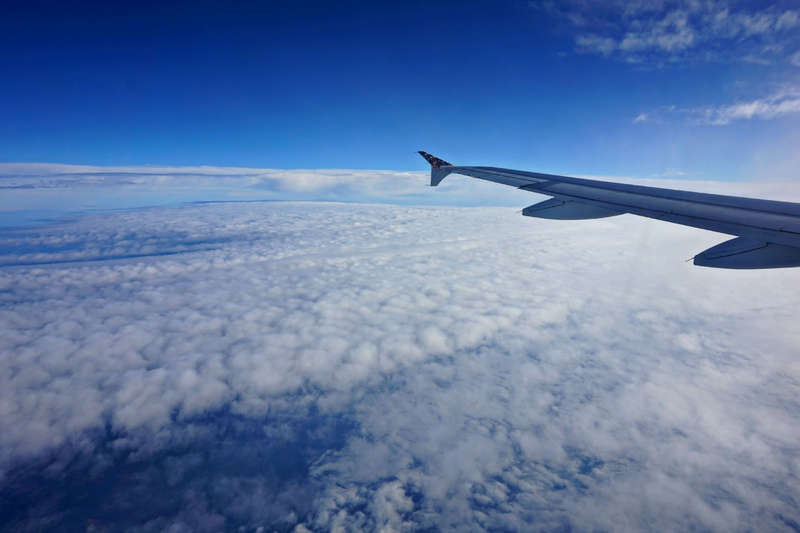 The moral of the story is three-fold, one: Horrible reviews aside, Frontier Flights is one of the least expensive ways to fly! The flights are pretty basic, and I can't always promise that you'll get travel credit for flight delays, but I appreciate their attempts to put the customers first. 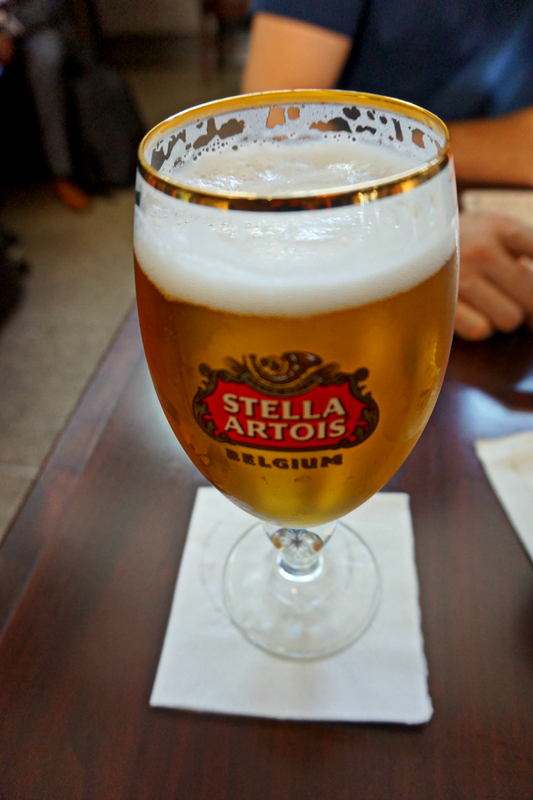 Two: Sometimes a flight delay isn't a bad thing (unless you have a fight connection). Make the best of the delay. Three: Be friendly and talk to people. Because we were so chatty and friendly, we met some amazing people on our journey. Overall, they saved us MAJOR dollars just by giving us free promo codes and helping us navigate the busy streets of Chicago. Since we have $300 in flight credit, Mr. A and I are already planning our next free trip. Luckily we're only a few hours away from ATL, which of course has one of the largest airports in the country. Frontier Flights has flights out of Atlanta to Montego Bay Jamaica, Punta Cana and Cancun for as little as $115 one way. Needless to say I have a feeling we're going to be adding a few more stamps to our passports sometime soon! What is your best travel story? 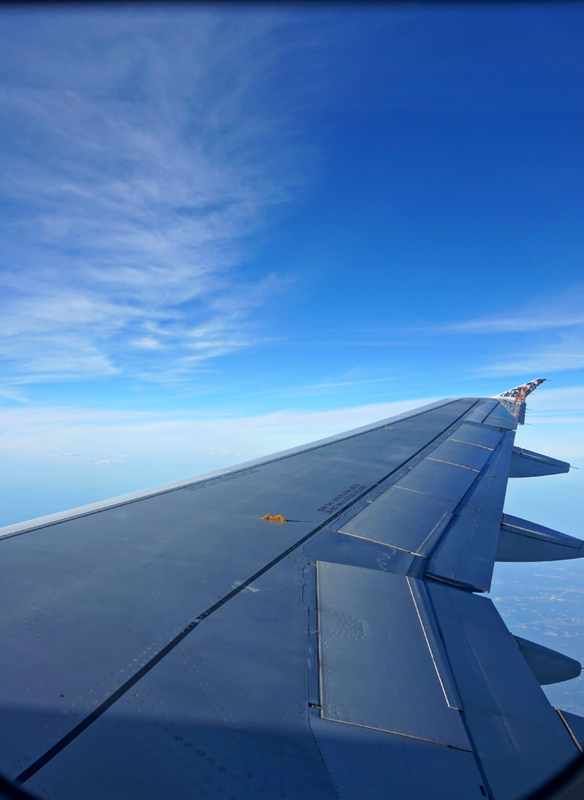 What are some of your money saving travel tips? Sound off in the comment section below! 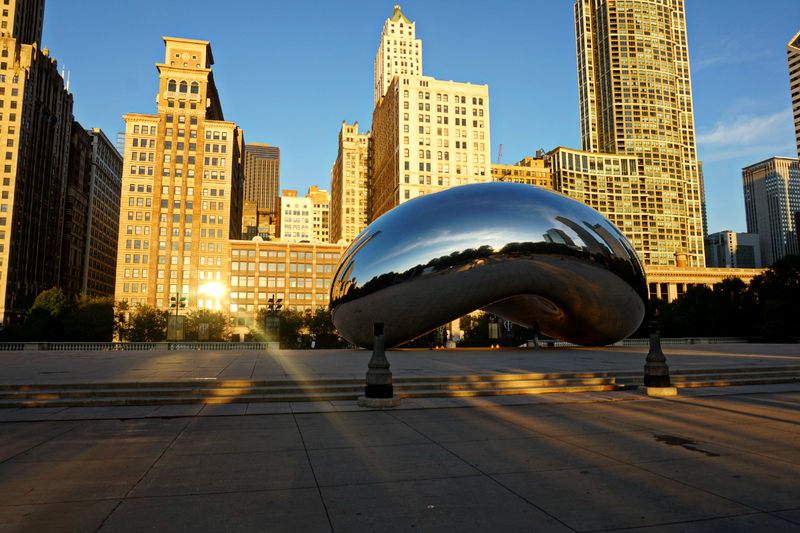 Next week I'll be sharing some awesome photos and tips on what do see, do and eat in the Windy City! Before my daughter came along, life was grand. The hills we alive with the sound of music. I was the perfect daughter who could do no wrong. I had already graduated at the top of my class with one degree and I was nearly done with the second. I had traveled the world, and I was laying down the foundation for a successful (and probably way too stressful) career in Public Relations. It's exhausting listening to others point out the various ways in which you are screwing your child up so badly that she'll require years of intensive therapy to recover from that one time you told her "No, you can't have an Oreo for a bedtime snack." 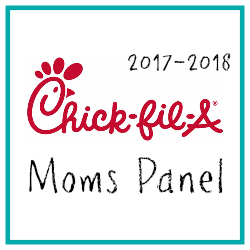 Four years in, and I'm here to tell you that it doesn't get better. You'll be that mother that realizes that life is so damn short that feeling inadequate because your child has a meltdown in the candy isle, is a waste of your time. Some days you might even lay down on the ground next to her kicking your feet and wailing. 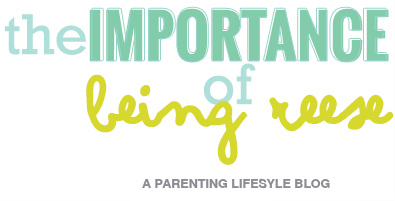 There's this one universal truth when it comes to parenting-- we all do it differently. Some days we're on our A game. We manage to pack them a perfectly nutritious lunch, get them to school on time, pick them up from school, chauffeur them to and from band, football, basketball, cheerleading and/or soccer practice, help them with their homework, prepare a Pinterest-worthy dinner that could give Rachael Ray a run for her money, and tuck them into bed at night. But some days all we can do is close our eyes and hope for the best. Parenting is the only role in which you are simultaneously the teacher and the student. We are not supposed to be replicas of one another. We should celebrate our individuality in parenting and strive to do things differently. We should revel in it and appreciate the wealth of diversity that parenting brings. I know I'm not the perfect parent. I don't have all the answers, not even on my best day. But I know this, I am forging a bond with my daughter that is absolute and unequivocally unbreakable. I am flawed. I make mistakes. I am not a perfect mother-- in fact, some days I'm not even a good mother, but I am hers and she is mine. That's what parenting is. It's not always getting it right or following some universal guidelines. It's being there--being present. So the next time someone tries to tell you how to be a parent, remind them that in your eyes, your child is the most precious person in the world, and that despite all evidence to the contrary, you've got it all under control. Chin up Buttercup, it only gets better from here. Disclaimer: I was given a set of Goosebumps books and free tickets to the Pre-screening to facilitate this review. As always, all thoughts and opinions about how awesome the Goosebumps franchise is, are truly my own. If you don't know by now, I'm a bit of a book nerd. My obsession with reading began somewhere during my socially awkward preteens years, and hasn't quite ended yet. So you can imagine how excited I was when I heard that my favorite teen series, Goosebumps, was going to be making it's way to the big screen. Yes, adulthood has done nothing to cure me of my insatiable desire to read--ALL. THE. BOOKS. Today, I'm so excited to help Goosebumps kick off opening week with an awesome giveaway for my fellow book junkies and their kiddos. But before we do that, let's talk movies. Last night Mr. A, Little J and I got to attend a pre-screening of Goosebumps, and I was pleasantly surprised! The movie kicks into gear right away. The humor is on point. There's just the right amount of young love. And all of R.L Stine's spookiest monsters made at least one appearance. It was an exciting trip down memory lane. Something that I enjoyed being able to share with Little J. Which brings me to my next point, it's perfect for adults AND kids. "Upset about moving from the big city to a small town, young Zach Cooper (Dylan Minnette) finds a silver lining when he meets his beautiful neighbor Hannah (Odeya Rush). The teen is surprised to learn that Hannah's mysterious father is R.L. Stine (Jack Black), the famous author of the best-selling "Goosebumps" series. When Zach accidentally unleashes the monsters from the fantastic tales, it's up to Stine, his daughter and Cooper to return the beasts back to the books where they belong." 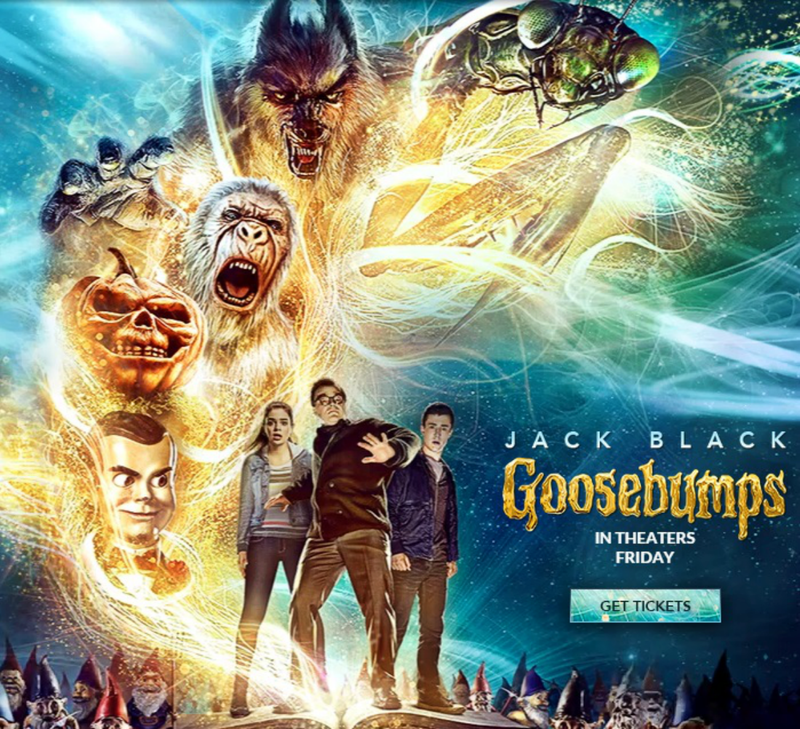 Goosebumps opens this Thursday nationwide. Grab your tickets and the kiddos because this is one the whole family will love! 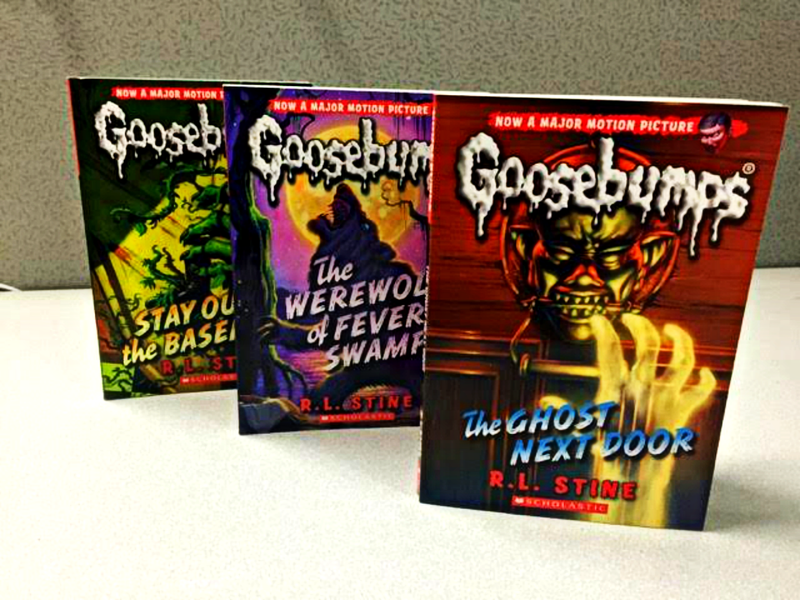 Now about that giveaway...Three of my lovely readers will win a spooky set of 3 Goosebump books. Follow the instructions on the Rafflecopter widget below to enter. Open to U.S. Residents only. Everyone loves to save a buck or two. At least I know I do. Back when I was into coupning, my days (and nights) were spent clipping hundreds of coupons and organizing them into my binder--which I affectionately named Reese's Moneymaker. Seriously, my binder has a name. And a cover page. Don't judge. Now that I'm no longer actively couponing, I'm finding other, more resourceful ways, to save some pennies. Enter the internet. Although the internet is filled with completely useful and titillating information, such as how Buffalo, buffalo, Buffalo, buffalo, buffalo, buffalo, Buffalo, buffalo is actually a grammatically correct sentence, there are other, even more useful things in the hidden depths of the internet. 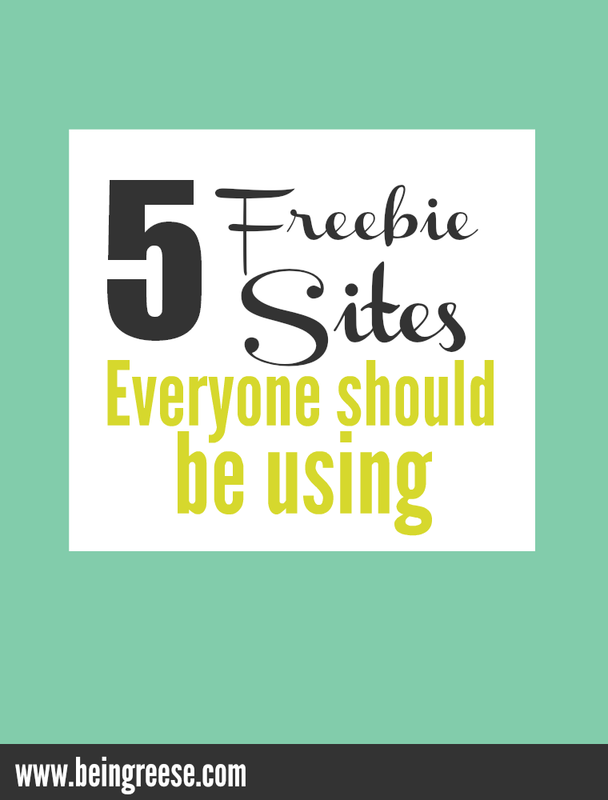 You guys may remember this post I did a few months ago about freebie sites? Well, I recently stumbled upon a few more really great sites that I wanted to share with you all today. 1. BzzAgent.com: I've been a BzzAgent for over a year and this is actually one of my favorite freebie sites. The best thing about BzzAgent is that you don't have to be a blogger in order to be a BzzAgent. Basically you go in, fill out ALL the surveys and sit back and wait for the campaigns. So far I've gotten over more than two dozen freebies, one included a Draftmark Beer Tap System valued at more than $60.00. I've tried cereal, Neutrogena hand cream and even Dr. Scholls in-soles. I actually prefer this over Influenster because it is a lot less demanding, and in my personal opinion, you get better opportunities. Also, you typically get tons of free coupons and samples to give out to friends and readers. I once got ten little bottles of Neutrogena hand cream that made great stocking stuffers! In exchange for all these awesome freebies, you will have to write a review, tweet, post on facebook, and if you want additional points, you can post about it on your blog. The more you do, the more points you get. And then there's the bonus. Every time you complete a task from the campaign you get points which get redeemed on a site called My Bonus Points. Once you rack up enough points you can redeem them for gift cards. It takes a while, but I've already gotten 2 $25 gift cards to Old Navy and Barnes and Noble. Not bad at all. 2. 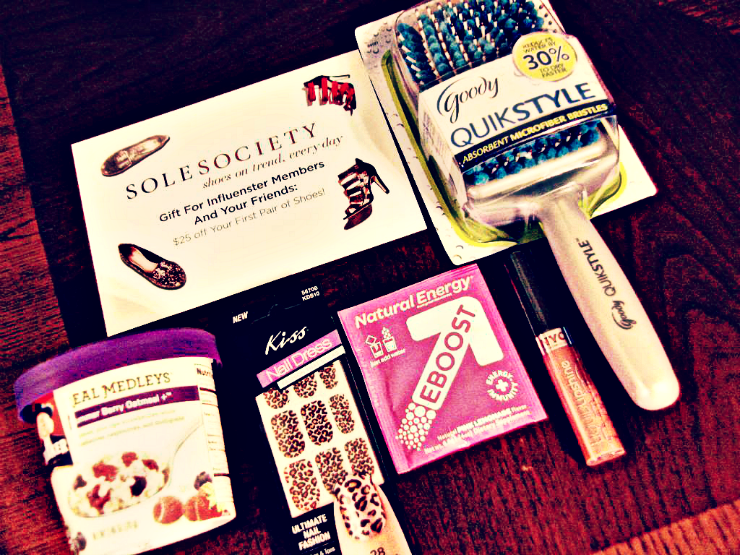 Influesnter: As I mentioned before, I prefer BzzAgent, but Influenster definitely it's perks. 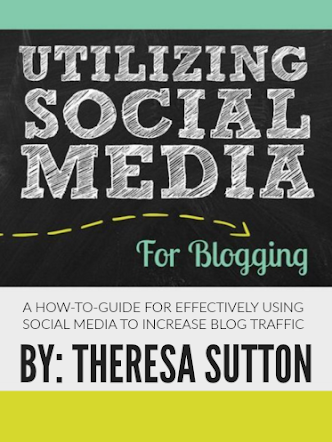 In order to take advantage of Inluenster, you just have to be social media savvy. Not necessarily a blogger, but it is a bonus. Inluenster differs from BzzAgent in that instead of reciving one perk at a time, you get a box, called a V-box, filled with various freebies. In order to get picked to receive a V-box, you'll have to fill out your profile and choose various categories that you are considered an influencer i.e. Parenting, Beauty, ect. Once you've established a relatively high score, you may be selected to received a V-box. The V-box typically comes with 5-8 (sometimes) full sized samples. Here's a V-box I received last year. In order to remain eligible for future V-boxes, you will have to take a mandatory post-box survey. In order to get selected for more campaigns, you typically have to follow all the companies that provided a sample via twitter and Facebook. You'll be required to tweet and share via Facebook and you'll get bonus points for unlocking various challenges. It's fun if you have the time and you get tons of free perks. 4.That Freebie Site: I've actually been using this site for years. I've gotten some pretty sweet swag from here. A few full-sized bars of deodorant, free totes, and dishwashing detergent. But the best part is, in addition to all the fun freebies, you can sign-up to take part in surveys for better products, and sometimes even cash. Although it can be difficult to qualify, I've made it in a few times and have a few extra dollars to show for it. 5. Freebie Finding Mom: I'm a huge fan of freebie finding mom. Back when I was a crazy couponing addict, I would stop by Freebie Finding Mom to get the scoop on the latest sales and coupons. I still swing by from time to time to get the lead on big sales, freebies and giveaways. The site is very well organized, one of the best out there. The freebies are practical and useful. So there it is, my roundup of some of my favorite freebie sites. What are some of your favorite sites for freebies?